This week's (belated) Sunday Night Suds looks at Saranac Cold Brew Coffee Lager. With things starting up for staff at Camp M, this week's Sunday Night Suds is a bit belated due to the move up schedule. So how else can I wake myself up after driving back and forth (and going to work) other than with a coffee lager. The Cold Brew Coffee Lager is not a typical coffee infused brew as it does not attempt to mimic the earthiness of a stout, nor is it an ale with coffee undertones. Instead, this brew tastes like an iced coffee, sans sweetener. I did not detect hops or even any alcohol bite. Rather this beer is almost like an alcopop, albeit made for coffee drinkers. 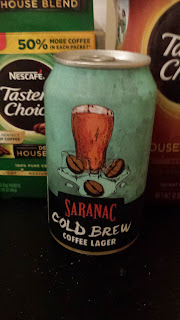 Saranac Cold Brew Coffee Lager is under the Kosher Supervision of the Va'ad of Detroit as is every other beer produced at the Matt Brewery plant in Utica, NY. Keep in mind, Saranac brews some of its beers off site and these bottles do not have kosher certification from the Va'ad of Detroit. To see what the experts on Beer Advocate think about the brew, please follow this link www.beeradvocate.com/beer/profile/99/235896.